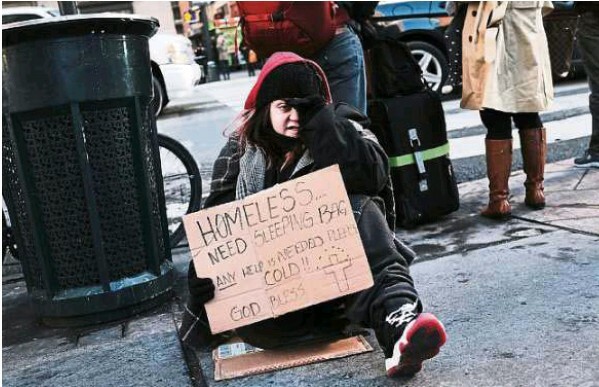 A young homeless woman panhandles on the streets of Manhattan in New York City. According to a new report released by the US Department of Housing and Urban Development New York City’s homeless population expanded by about 4% in 2017. American culture and a new tax Bill are exacerbating chronic poverty by helping to widen the wealth gap. SITTING among a jumble of his few possessions on a San Francisco sidewalk, 41-year-old “Kaels” Raybon has begun to accept the bad choices he made. He was a drug user, and did jail time. By the time he was let out, his wife and four children – two boys and two girls – had left him. Other family members had died and he had nowhere to live. He has now spent over 15 years on the street. 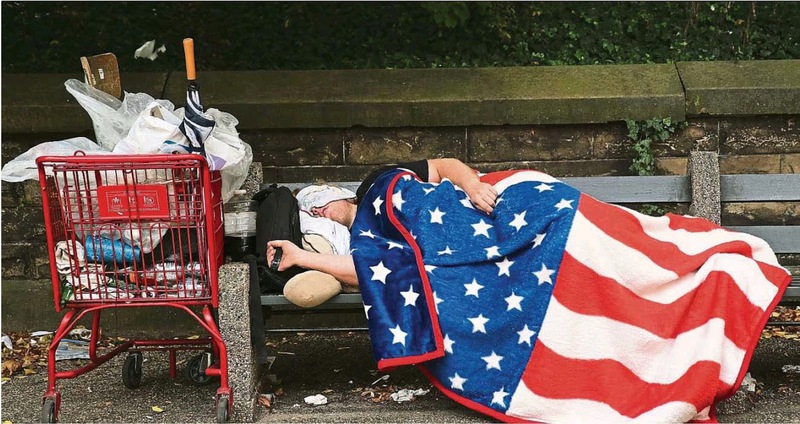 America may be the land of equal opportunity – but like many other countries, there is a thin line between a life on the street and a roof over one’s head. Poverty creates its own loop; a prison record, for instance, makes it difficult to find employment. Raybon’s voice trembles as he speaks of his children. Raybon is among those who make up the most visible indicator of America’s worsening poverty and inequality – over half a million urban homeless. They are a stark contrast in arguably the world’s richest, most powerful and most technologically innovative country. But homelessness is only the visible tip of the poverty iceberg. Large areas outside big cities are mired in chronic poverty. The definition of poverty varies, but a commonly used measure from 2015 is an annual income of US$12,000 (RM47,500) or less. Forty-one million Americans live in poverty – 12.7% of the country’s population. Some 46% of those live in “deep poverty” – on an annual income below US$6,000 (RM23,700). Among them are 1.5 million households, including 2.8 million children, who live in extreme poverty or on less than US$2 (RM8) per person per day. “These are people who cannot find work ... who do not qualify for any other (welfare) programmes or who may live in remote areas. They are disconnected from both the safety net and the job market,” Dr Premilla Nadasen, author and professor at Barnard College in New York City, wrote in the Washington Post newspaper on Dec 21. Poverty is in the news again on the heels of a scathing 15-page statement released late last year by Dr Philip Alston, a tall, lean, 67-year-old New York University law professor from Melbourne, Australia, who is the United Nations’ Special Rapporteur on Extreme Poverty and Human Rights. A special rapporteur functions like an investigator and reports back to the UN. Dr Alston is not known for beating about the bush. After a 15-day swing across six American states and cities, he is warning that worse is in store for America’s poor, at the wrong end of an increasingly widening wealth gap, and in an environment and official culture in which if you are down and out, it is probably your own fault. The recent passage of the Republican Party’s tax Bill will make their lives worse, says Dr Alston. The Treasury Department has explicitly listed welfare reform as an important source of revenue in part to make up for the deficit that the tax cut is likely to trigger. More important, however, is the culture. “In a poor country, there are two starting points – that there are social rights, and citizens have a right to healthcare, a right to education, a right to food,” Dr Alston says at an interview in his booklined office at New York University. “In the US, it’s the exact opposite,” he says. “There’s no such thing as social rights. If people are living in abysmal conditions, it’s their fault because we have equality of opportunity. The US$1.5trillion refers to the Republicans’ tax Bill, passed just before Christmas that will bring the middle class some relief but inevitably, analysts say, end up benefiting the wealthy disproportionately. America’s wealth gap has been steadily widening. On average in 1981, the top 1% of adult Americans earned 27 times more than the bottom 50%. Today, they earn 81 times more. She added: “The shredding of the safety net led to a rise in poverty. The United States has the highest child poverty rates – 25% in the world. In the course of his tour, Dr Alston saw houses in rural areas of Alabama surrounded by pools of sewage. “The state health department had no idea how many households exist in these conditions, nor did they have any plan to find out, or devise a plan to do something about it,” he says in his statement. He could not help noticing that most of the area’s residents were black. But while racial divisions are not far below the surface, it would be misleading to assume that poverty is generally worse in the Native American and African American minorities. It cuts across all ethnicities. There are eight million more poor white people than black people. Like Rudy Damian, 53, who as a teenager ended up homeless in San Francisco after taking drugs and alcohol and being involved in crime – a common pattern contributing to broken families and financial ruin. He has several missing teeth – dental care is not covered by most health insurance and the poor, at best, can go only to hospital emergency rooms where invariably a tooth is simply extracted. Fragmentation of families and the weakening of community support contribute to the isolation of homeless people in particular. But there is more. “Caricatured narratives” drive the debate on poverty and homelessness in America, according to Dr Alston. 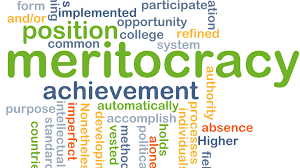 The rich are seen as “industrious, entrepreneurial, patriotic, and the drivers of economic success”. The poor are “wasters, losers and scammers”. In Los Angeles, he found that the objective for the local authorities was to raise the standard of Skid Row, an area less than a square kilometre but containing many hundred homeless, to that of a Syrian refugee camp. Sources: The Straits Times/Asia News Network, by Nirmal Ghosh who is The Straits Times ’US Bureau Chief. 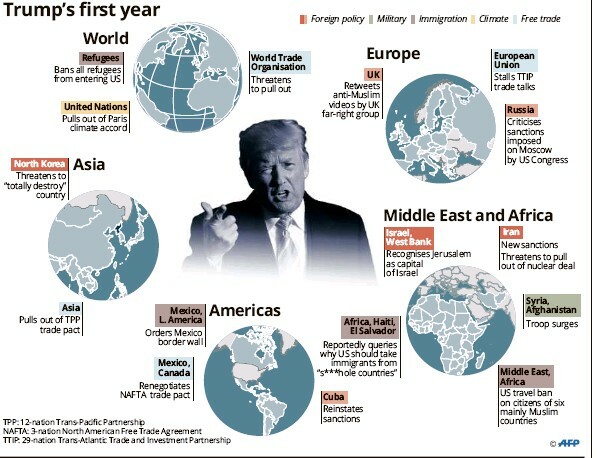 Beijing: China has denounced the United States government for what it calls its “Cold War and zero-sum mentality” in its latest national defence strategy, which named China and Russia as “revisionist powers” that “seek to create a world consistent with their authoritarian models”.